Using biominerals to answer questions about fish spatial ecology, life history diversity, population structure and management. I am interested in marine fish movements and stock structure, and how it ties into sustainable management. For my current (UCB) and previous (UCSC) postdoctoral positions I have been focusing on Chinook salmon (Oncorhynchus tshawytscha) life history diversity using otolith strontium isotopes. The position involves synthesizing and analyzing existing juvenile outmigration data, otolith microchemistry data, and environmental variables to understand mechanisms of life history diversity, habitat use and juvenile salmon survivorship. My PhD centered around understanding the relationship between otolith microchemistry (trace element concentrations), physiological condition and ambient environmental conditions, using plaice (Pleuronectes platessa L.) as a model species. 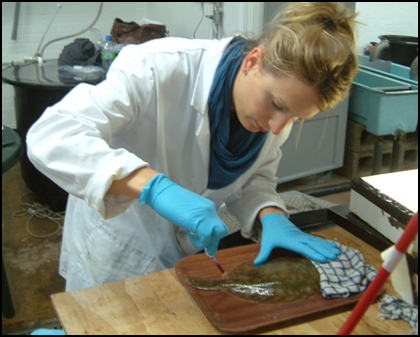 We carried out experimental work investigating the blood and otolith chemistry of juvenile and adult plaice under known conditions, and worked with otoliths from wild plaice tagged with electronic data storage tags (= 'known' movements). By temporally matching ambient conditions with otolith composition, we showed that some elements were under environmental control and could be a useful tool for reconstructing individual movement pathways, while other elements were primarily under physiological control and would be better suited to answering other types of questions, such as skipped spawning frequency. Sturrock, A. M., Johnson, R.C. (2013). 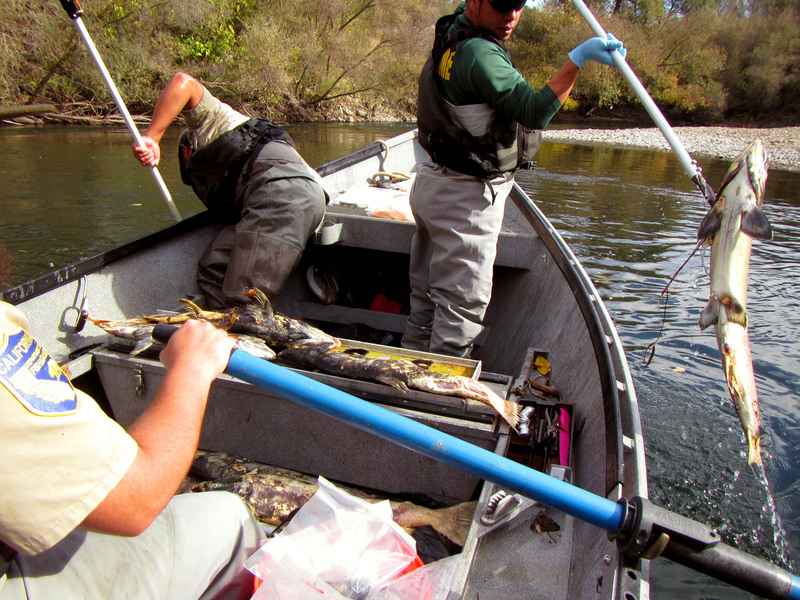 Contribution of hatchery and natural origin Chinook salmon to the Lower Yuba River. Report prepared for the Bay-Delta Sport Fishing Enhancement Stamp Program & CDFW. Award number P0981101. Sturrock, A.M., Whitman, G., Johnson, R. (2012). Otolith microchemistry to determine size at outmigration of adult Chinook salmon in the Tuolumne and Merced rivers. Report prepared for AD Consulting and CDFW. 30 pp. 2014 - Bruce Herbold Prize for best oral presentation at the Interagency Ecological Program annual meeting, Folsom, USA. 2013 - Delta Science Fellowship sponsored by the Delta Science & California Sea Grant College Programs ($144,904). 2012 - Fisheries Society of the British Isles (FSBI) Representative at the International Council for the Exploration of the Sea Annual Science Conference in Bergen, Norway (£1000). 2011 - Best poster (1st place) at the 8th International Flatfish Symposium in Ijmuiden, The Netherlands. 2010 - Best poster (2nd place) at the Institute of Fisheries Management meeting in Portsmouth, UK. 2010 - Natural Environment Research Council Research Grant for 3 weeks instrument time at the Edinburgh Ion Microprobe Facility (c. £20,000). 2010 - FSBI/International Fisheries Section student travel award to attend the American Fisheries Society conference (Pittsburgh) and visit Woods Hole Oceanographic Institution (c. £1,500). 2010 - Challenger Society travel award to attend the Marine Biological Association conference in Glasgow, UK (£250). 2009 - FSBI Travel Award to attend the International Otolith Symposium in Monterey, USA (£1,000). 2008 - FSBI PhD Studentship to study at the University of Southampton & Centre for Environment, Fisheries and Aquaculture Science (£53,530). 2007 - Royal Forest and Bird NZ small project grant (NZ$2,000). 2006 - John Jillet Prize for best research proposal and best student presentation, University of Otago, NZ. 2006 - Leverhulme Trust Study Abroad Studentship for MSc at the University of Otago, NZ (£50,000). 2003 - Edinburgh University grants for expeditions (c. £25,000 from the Davis Award, Weir Fund, Faculty Scholarship Prize, Barson Bequest, Gordon Foundation and College Vacation Scholarship for Students with Exceptional Merit).